The town has dubbed itself the “Last great Colorado ski town,” but Crested Butte is also worth a visit after the snow melts. Located a little more than four hours southwest from Denver, the small, former mining city feels like it exists in its own little bubble of relaxation. Speed limits are extra slow, the downtown looks and feels old-fashioned, and the scenic drives just beg for you to take your time and enjoy the views. There’s a ton of adventure awaiting in Crested Butte beyond skiing—including many activities that are quirky and unique, just like the town itself. Even after the ski slopes close down, the mountain doesn’t. Throughout the summer, you can still take a chairlift ride up the Crested Butte Mountain. Take the Twilight Ride on the Red Lady Express chairlift on select evenings during the summer and watch the sun set while you are in the sky. Twilight lift tickets typically include a drink and are offered most of the summer, but weather also can affect that. While on the chairlift, also keep your eyes open for the old mining camp, Gothic, and sweeping views of the valley. Other lifts run throughout the summer, too. If a noon ride better fits your schedule, hop on the Silver Queen lift, get off at the peak and have a picnic with amazing views. Summer lifts typically start running in early June. Crested Butte has some stunning scenic drives, and Kebler Pass is especially beautiful when the leaves are changing colors in the fall. The road isn’t all paved, but it’s not extreme. Bring some snacks and pull off at a designated viewing point for a little picnic and photo shoot. 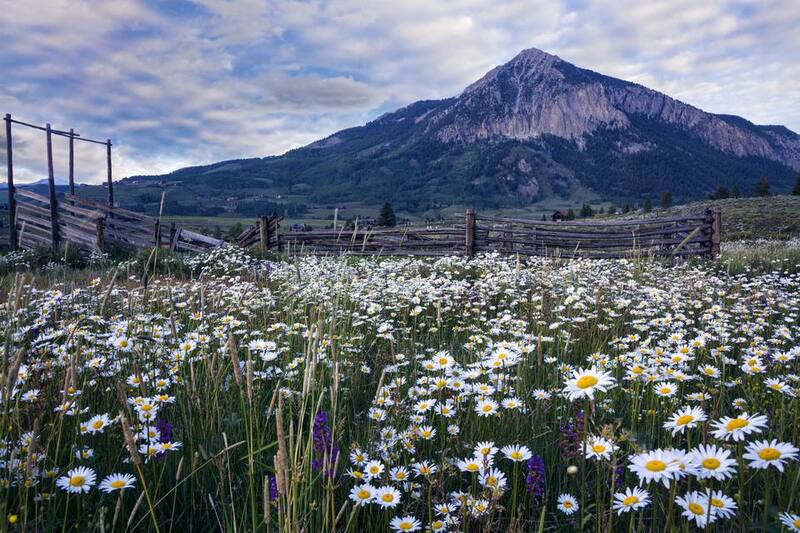 Crested Butte has multiple Colorado Scenic Byways, like the West Elk Loop and the Silver Thread Silver Byway. To see wildlife, head up Taylor Canyon, where bighorn sheep like to hang out. The drive to Taylor Reservoir showcases water scenery, and you can go camping at the reservoir. There are easy-to-access campgrounds, off-road spots, and two developed campgrounds in the area. At the tip-top of Crested Butte Mountain, at the pinnacle of the Red Lady Express lift, you’ll find a 20-plus-target archery course that’s open all summer. It’s suitable for all levels and is scattered throughout the mountain in a one-mile-mile loop that starts and ends at the lift. Kids can join, too. The summer program offers archery lessons to kids 7 and older. Crested Butte is known for its great hunting, and this provides a way to tap into that culture, without having to pick up a gun—or to practice your target, if you are visiting to shoot. You can tell a lot about a community by its historical buildings, and also learn something by hanging out with the locals in a bar. Each summer in August, Crested Butte brings the two together for a unique Historic Pub Crawl. Guests can hop between the different historic drinking establishments of the town and learn stories about the Wild West and its saloons. A historian will be waiting at each bar to share the tales. Participants get a pint glass (to keep) that they can fill up with free drinks at the local bars. At each stop, they also get one playing card. At the final stop, the museum, participants throw down their hands. The best hand wins part of the pot. It’s like cowboy poker games, but without straight-shooters and spurs. There are plenty of different ways to explore Crested Butte: rafting, jeep tours, fishing trips, hiking, and even zip-line. This Crested Butte Zipline Tour spans five different lines united by various platforms, such as bridges and towers. It will keep you soaring high in the sky for up to two hours. Another fun way to tackle the mountain is on a bike. Crested Butte has more than 700 miles of singletrack trails and is a popular destination for mountain bikers. You can find trails for all levels, from beginner to advanced. A good beginner-intermediate trail is the Lupine Trail. It's not far from town, and has enough peaks and drops to be interesting, but isn't too extreme. Best of all, the views are amazing as per the name of the trail; the route is lined by flowers. Crested Butte offers some popular, family-friendly summer concert series. There are the Alpenglow concerts, a free outdoor show on Monday evenings, and the ​Live From Mt. CB series, which brings free, live music to the base of the mountain. Bring a blanket and relax to music under the sky. Check the calendars for the musical line-up. The best time of year to spot elk is early fall when they’re most active as they try to prepare for the cold winter and the elk perform their famous bugling and mating ritual. One popular tourist activity is to listen to the elk bugle and try to catch a photo of them, but do keep your distance from wildlife. Don't be the tourist who gets mauled for a silly selfie. Warning: Bears live here, too. If you run across one, definitely don't try to take a photo. Montanya Distillers is a micro-distillery located at 9,000 feet above sea level. Although it’s not the highest distillery in the state (head to Breckenridge for that honor,) the altitude does still affect the handcrafted rum production, from distilling to aging. Take a tour and taste it for yourself, and if you’re lucky, you might catch live music during your visit. Three Rivers Resort is near Crested Butte, located in the woods by the tiny town of Almont. You can bunk in a cabin dating back to the 1800s, right close to the river. All the cabins come with full kitchens, baths, and a grill for cooking out. Some have laundry and hot tubs. Activities include fishing, hiking, rafting, kayaking, horseback riding, four-wheel drive excursions, and more. The Gunnison National Forest couldn’t be closer, so make sure to pay a visit. Fun fact: Teddy Roosevelt created the forest in 1905. When in Crested Butte, you have to spend some time strolling down historic Elk Avenue. This colorful downtown is lined with old buildings, accented by a mountain view backdrop. Elk Avenue is where most of Crested Butte's action is located, including the best restaurants, nightlife and locally-owned shops. It's a great place to stop on your last day in town to pick up gifts and souvenirs to take back home.